We can migrate any needed data, back up the information to your server or external drive, then wipe or destroy the hard drives for you. We can assess the age of your old computers and either dispose of them for you or point you in the right direction of computer recyclers. Plus, the quicker you dispose of your old computers, the easier the process will be. Recyclers will be able to send less of your equipment to landfill, and you’ll be less likely to forget how valuable the drive contents are. It’s time that you see what hackers already know about your business. At Nice Guy Technology, we’re so committed to protecting the security of your business that we’re offering you a complimentary Dark Web Scan. This is part of our celebration of adding a Cyber Security Expert to our team and our recent designation as a Managed Security Services Provider (MSSP). As a MSSP we can offer an advanced level of security monitoring and protection for your business. Together, we’re on a mission to keep your business compliant, keep your data secure and keep hackers out! Only 33% of businesses are taking the proper steps to protect themselves from a cyber attack. In fact, 60% of small companies are out of business within six months of a breach. Start My Dark Web Scan! ​Business owners, learn from my mistake. Be careful where you try to save money! Hey there, it's Mary from Nice Guy Technology. I'm going to tell you a little story. So lately I've been trying to watch my personal spending, cut out some things that could save a few dollars here and there. So the last several months I've skipped a few trips to the salon so my bangs have been down in my eyes and you know, gray hair is peeking out a LOT. So last night I got all fed up with it. I grabbed a drugstore box of hair color (it was half price with a coupon) and some scissors I found in the drawer. Seemed like a great idea at the time. I don't know what color this is but it's not mine. Well then I guess it's mine for a while. So what I did with my hair is exactly what lots of businesses do with their technology. They slap some antivirus on the computers and hope for the best. Why spend money if you don't have to, right? Think about this though. If all of your company's computers were wiped out today, how long would it take you to become operational again? How quickly can you replace that equipment, your software, your customer data, logins, passwords? How much would that downtime cost your business? Or even worse you experienced a data breach. What's the worst that could happen? You face fines, lawsuits, you lose customers and your great reputation that you've built over the years. Join us for our January lunch & learn - Cyber Security: Is Your Business Prepared? When talking about the risk of a cyber attack on your business, it’s not a matter of "if" but "when”. Join us for lunch as we discuss the critical topic of cyber security and how to protect your business. Is your business really at risk? Why are small businesses such a big target? 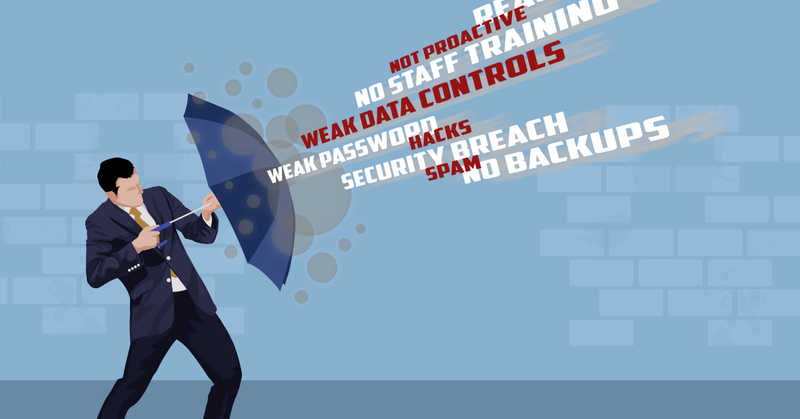 What can you do to protect your business, data and employees? What's the cost of cyber security? You'll walk away from this session with a better understanding of your company's security vulnerabilities and specific action you can take to protect your business. All attendees will receive a complimentary Dark Web scan for their business. Each attendee will be entered to win one of several door prizes including a Google Home Hub, Google Home Mini, and various Gift Cards (must be present to win). What's included in the cost of my $10 ticket? Conventional wisdom states that cluttered workspaces lead to a disorganized mind. Mess prevents productivity and begins to hamper professionalism. Shouldn't that apply to the computer desktop too? The simplest way to clean and organize your digital desktop is to add more space. Just adding a second screen doubles the available room and makes organization a breeze. Getting work done with a single-monitor setup is a balance of poor compromises. There never seems to be enough space and the little space available is full of clutter and mess. Switching between windows or tabs wastes time and distracts from work to be done. Stacking windows together, side-by-side, or top and bottom wastes valuable screen real estate. The resulting clutter of windows makes it hard to focus on what is important. While most tasks can be tackled feasibly with a single monitor; two makes the same tasks faster, simpler, and much more enjoyable. Graphic design, image manipulation, and editing are key areas that make the most of a dual screen setup. Stacking one image on each screen allows you to make quick comparisons to make sure your work is going in the right direction. Organizing your editing space is made simple too. Stacking your tools, menus, and options on one monitor with your image maximized on the other helps to stay focused and finish the task. Having more than a single screen helps you to track tasks you need to keep on the back burner. A team chat window to keep on top of collaboration, status updates for business-critical services, or the latest stock price. These windows and dialogues can remain open and serving updates on a secondary screen while you keep your work focused on your first. It is not uncommon for stock traders or financial analysts to maintain 6 or more screens running from a single computer. Many use this to track various stocks or indices so they don't miss a beat. Multiple monitors can be arranged in almost any practical configuration imaginable. While most monitor setups are normally horizontal you can arrange them vertically, a combination of the two or try using 3, 4, or 5 monitors to help your workflow. This setup is used often by software engineers, editors, and users reviewing large amounts of text. Multi-screen setups, no matter how they are arranged, behave the same as if all the monitors were just a single screen. Mouse input moves from one monitor to another as if there was no difference between them. From the user's perspective, there is no difference to how they interact at all. There is a scientific advantage to multi-monitor setups too. A survey by Jon Peddie research found that adding an extra monitor boosted a user’s output by as much as 20 to 30 percent. A productivity advantage of even 10 percent is prized and very hard to come by in the business world. Receiving a productivity reward of over 20 percent for just the cost of adding a second monitor is something few firms can afford to pass up. The satisfaction of de-cluttering your digital desktop and keeping your focus in the zone is worth it alone. When considering IT threats to your business many articles focus on hackers, viruses, and attacks from external threats. These dangers are real, constant, and easily identifiable. In many cases, however, the largest threat to a firm comes from inside the business itself. ​People inside the firm often pose the largest single threat to systems and security. These individuals often have trusted access and a detailed working knowledge of the organization from the inside. Employees therefore deserve the largest security consideration when designing a safe business system. It is important to first distinguish the type of dangerous employee we want to defend against. We're not talking about an otherwise model employee accidentally opening a malicious email or attachment. Rather, a disgruntled employee seeking to damage your business. Some firms, particularly young businesses, grant employees system-wide permissions from day one. This can make administration appear simple, preventing further IT requests in future. Granting system-wide access is an inherently risky strategy. Private information relating to the business should be restricted access information. Many types of files need to remain confidential, often as a legal requirement. Human resource files, salary information, and employee documents should be limited to only a select few employees. Yet, businesses often keep confidential information in public places on the network. Granting system-wide access can appear to save time short term. It is, however, a security policy which only serves to cause security, administration, and potentially legal troubles in the future. The principle of least privilege is a vital tool, helping you to handle internal IT security. It defines a security policy which ensures staff can access only the resources, systems and data they require to carry out their job. ​The policy protects the business from many different types of threat in day-to-day operations. Even where malicious attachments have been opened by accident, the damage is limited only to the work area of a single employee. This results in contained damage, less time needed to restore from backup, and drastically reduced downtime for the firm. ​Along with limiting accidental damage, malicious employees looking to destroy or steal data are limited too. With restricted access, an employee with a grudge or profit motivation can only damage or steal from their own area of operation. This helps to ensure that no single employee can damage the entire firm's operations. A member of staff within Human Resources, for example, may have read and write access to the employee database. This will likely include payroll information and sensitive data. This same member of staff would have no need to access sensitive client data, such as sales information, in normal working conditions. Using the principle of least privilege, each employee may only have full access to systems that are directly related to their role. Similarly, some systems may be visible to a wider group of staff members even if they can only be edited or removed by one or two people. ​In some cases, a security policy may be defined by even finer details than a person’s role within the organization. An HR employee should not be able to edit their own file to change salary information for example. An employee file might only be edited by their superiors in such a case. Additional parameters can be used to assign privileges to enable the business hierarchy to work within the IT network. Seniority, physical location, and time are all examples of factors that can restrict access to critical systems and secure data. We can tailor your network to your business, locking down your data to ensure data is only accessed on an "as needed" basis. Call us at (614)-233-1648 for all of your IT needs. You have a business to run. Managing your IT is our business. Companies that suffer security breaches nearly always have one of these IT security problems. ​Is your company guilty of any of them? A shocking number of businesses are not backing up their data properly. According to market research company Clutch, 60 percent of businesses who suffer a data loss shut down within six months. Not only should every business be fully backing up their data, but their backups should be regularly tested to work too. It's a step that businesses miss surprisingly often. Many businesses don't find out that their backup can't be used until it's already too late. The world is constantly changing. The IT world doubly so. Attackers are always figuring out new ways to break into businesses, hardware evolves faster than most can keep up, and old systems fail due to wear and tear far quicker than we would like. A huge number of businesses wait until these issues impact them directly before they respond. The result is higher costs and longer downtime. By responding to hardware warnings before it fails, fixing security holes before they're exploited, and upgrading systems before they are out of date: IT can be done the right way. Being proactive about your IT needs means systems don't have to break or be compromised before they are fixed. The result for your business is less downtime, fewer losses, and lower IT costs. Humans in the system are commonly the weakest point in IT security. Great IT security can be a bit like having state-of-the-art locks on a door propped open with a milk crate. If staff aren't trained to use the lock, it's worth nothing at all. A surprising number of people will use the password "password" to secure some of their most important accounts. Even more still will write their own password on a post-it note next to their computer. In some cases, many will even use no password at all. Strong passwords act, not only as a barrier to prevent unwanted entry, but as a vital accountability tool too. When system changes are made it's often essential that the account that made changes is secured to the right person. It can be easy for both employees and firms to focus on the costs of devices and hardware purchased for the business. The reality is that the data held on devices is almost always worth many times more than the device that holds it. For many firms, their approach to data hasn't been changed since the firm was first founded. Critical data is often held on single machines that haven't been updated precisely because they hold critical data. Such machines are clearly vulnerable, outdated, and prone to failure. If you need help securing your IT to protect your business, give us a call at 614-233-1648.